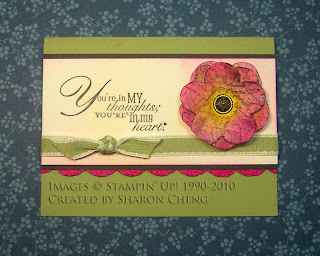 This card was one of the Workshop Wows that I presented at Stampin' Up! 's Regional Seminar in Fort Worth. It is the card that I used to apply as a presenter. To see the other projects that I presented, please click here. 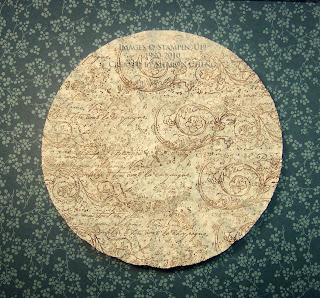 The coffee filters that I used in this project are about 8" in diameter. They are the 8-12 cup size that you find in grocery stores. To make larger pumpkins, you can use the larger commercial coffee filters. You may be able to find them in restaurant supply stores. Step 1. With Chocolate Chip, wheel Very Vintage over the entire coffee filter. It's okay if you don't wheel everything perfectly. This project is very forgiving. Step 2. Fold the coffee filter into fourths and punch with the Fancy Flower punch. 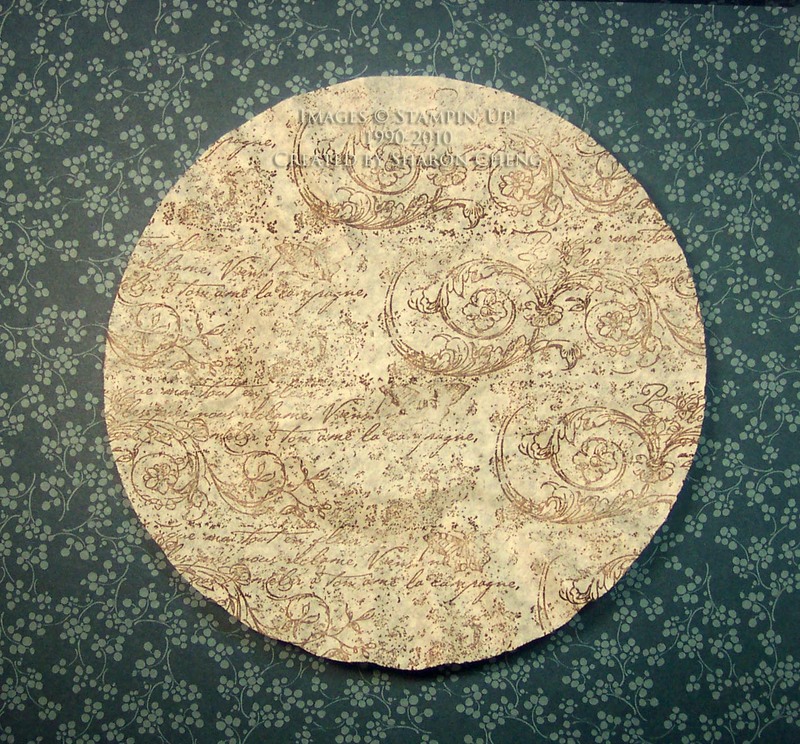 The coffee filter paper is so soft that you'll want to punch 2 - 4 layers at the same time for the best results. Many thanks to Marilyn Young for figuring that out at one of our demonstrator meetings. Step 3. Take one flower and sponge the center with Daffodil Delight. Sponge the edges with Melon Mambo. The last step of edging with a Chocolate Chip marker is optional. Here is a close of up what that looks like. You use the brush end of the marker and touch the edge of the filter paper. Filter paper is very absorbent and will take the ink quickly. I got this tip from one of my customers. She likes to edge the letters on her scrapbook pages. In the spaces that are too small to use an ink pad, she uses the marker brush tip. Repeat Step 3 until you have 3 flowers. Layer them one on top of each other. 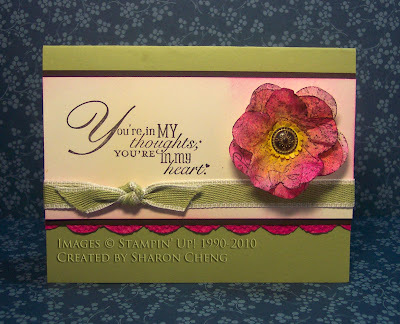 Use your paper piercer to punch a hole through all three flowers and the Very Vanilla card stock. Add a vintage brad in the center. 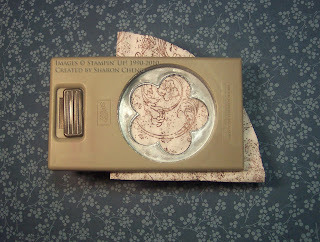 I did punch two of the small cogs out of Daffodil Delight card stock and added them to the brad. At this point you'll notice that your flower is still pretty flat. Step 4. Scrunch up the entire flower and gently open the flower back up. Arrange the petals so that you like them. And that's how you get a quick and easy 3D flower! Very Vanilla: 5 1/5 x 2 1/2. I lightly sponged Daffodil Delight and Melon Mambo on the Very Vanilla. Early Espresso: 5 1/2 x 1/2 (I just have small strips on either side of the Very Vanilla cardstock. It saves paper, is easier to me to get a thin mat and my card doesn't get so thick. Melon Mambo: I used the Tasteful Trim die to cut the scallops out and then ran them through the Square Lattice embossing folder. While you can't see it in the picture, it gives a nice texture to the scallops. 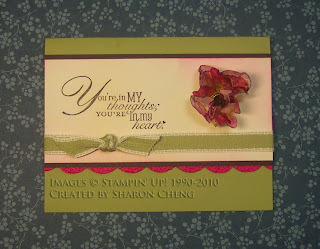 And when you're making a lot of cards, it's much faster to use the Big Shot instead of the border punches. The sentiment is stamped with Early Espresso ink. 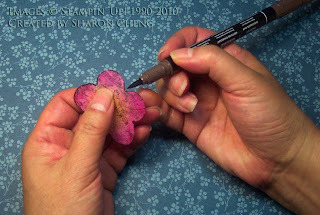 I hope you enjoy making this flower and other flowers with coffee filter paper. Sharon, I love this flower, thanks so much for sharing! I'm going to try this one too!